NHS England » Can huddles really help? Despite the very real efforts of my obstetric colleagues, neonatal admissions are rarely planned. But some things are less unexpected than they seem. Take the other evening: I was on the phone to the consultant at our sister hospital who wanted to transfer a baby born 11 weeks early. The team had stabilised this baby and she was doing well but their neonatal unit only looks after babies from 34 weeks gestation so she would need to be transferred in an ambulance across North London. Her mother would stay overnight at the hospital of delivery until we could find a space for her in the morning to come over and be with her baby. On many occasions, it is clinically unsafe to transfer mothers before delivery. Frequently, however, the window for safe transfer is missed. The frustrations of the delivery suite coordinator organising the transfer of a woman before delivery are echoed in hospitals up and down the country. Multiple conversations between obstetric, paediatric and midwifery teams morph into a multitude of telephone calls across the network and beyond trying to find an available delivery suite bed only to be told that their neonatal unit is full, or vice versa. Several hours pass. Frustration builds. The likelihood of imminent delivery increases. The window for safe transfer closes. More conversations follow as the local team prepare for the delivery of a baby they know will need to be transferred to a more specialist centre. The paediatrician is acutely aware the outcome is poorer for babies born outside the specialist centres, especially at the extremes of prematurity. Effective communication is the key part of the solution in these situations – and huddles provide just this. A huddle is a short, focussed briefing which brings together representatives from across key staff groups to identify potential problems or safety issues, such as challenges to the safe flow of patients across a department or hospital. An approach which originally began in the aviation industry, huddles have gradually been adopted as an effective way of working in the equally complex environment of healthcare. Huddles within a maternity department can enable the timely identification of high-risk deliveries and facilitate earlier discussions with receiving specialist units. Instead of multiple, repetitive, individual conversations, a single conversation at a huddle can precipitate earlier transfer of mothers. Huddles can also function on a much broader scale: neonatal units across Scotland huddle daily via teleconference facilities to share their cot status, safety issues, impending high-risk deliveries including those requiring transfer to, and from, more specialist centres. These daily virtual gatherings enable faster, earlier and therefore safer care delivery at the most appropriate centre and they also breakdown silos and build a sense of community and teamwork. Implementing handovers and huddles: a framework for practice in maternity units from NHS Improvement is a “how to” document and builds on the experiences of teams across healthcare systems both within the UK and internationally. Like huddles, handovers are crucial vehicles for the transfer of information. Unlike huddles, the aim of handovers is not only to share critical information but also to transfer clinical responsibility for a patient or group of patients. Whilst the two differ in purpose and content, they share the broader principles for implementation. The NHSI framework for practice will help teams across the country implement efficient and effective handovers and huddles. So, what came of my musings that evening? A daily cross-site huddle. Implementing huddles has been a huge learning curve and we have made mistakes on the way and discovered some easy wins where we least expected them. Now, if you wander by our delivery suite at 11am, you will find maternity and neonatal teams teleconferencing with our maternity and neonatal teams at our sister hospital discussing safety issues, patient flow concerns and any challenges to running a smooth shift that day. There is a sense of camaraderie that is growing daily; a real sense of one team working together to deliver the right care at the right time in the right place to our families. Shanthi Shanmugalingam is a neonatal consultant with a passion for improving maternal and neonatal care. She joined the Starlight neonatal team at Barnet Hospital, Royal Free London NHS Foundation Trust in 2014. 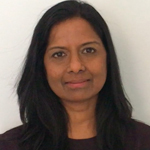 Shanthi is the neonatal representative for the Royal Free Maternity and Neonatal Health Safety Collaborative team implementing cross-site maternity huddles. She has been involved in several successful quality improvement initiatives including the East of England Neuroprotection project and the Royal Free Keeping Mothers and Babies Together clinical pathway (@MumBaby2gether). She lives in North London with her husband and two children and believes that the best thing about 2008 was the return of Cadbury’s Wispa bar.